Two Fun Cocktail Beaded Rings to Make! Some people are really fond of large showy rings. Maybe to wear for your next dinner party? One really fun cocktail ring Aleshia of Beadiful Nights' Spiral Galaxy one. Check out her video tutorial! Doesn't the top ring's colors make it patriotic? This tutorial by The Bead's Knees couldn't be any easier because you start with a 5 loop adjustable ring base. It's great practice for wire wrapped loops as you will need many of them! 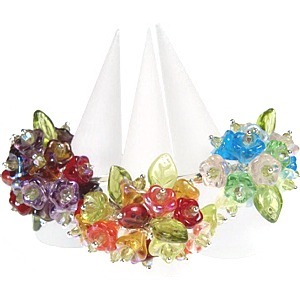 The fun comes with choosing the right flower and leave beads and placing them in a pleasing order. Remember the dangles do move so this is not a rigid arrangement. It might be a little awkward but try and wrap as close as you can to the ring loops especially towards the end. I love the way you show and give instructions. I have learn how to make the ring. Thank you. Wonderful ring tutorials Pearl. The flower ring looks pretty and very Spring time. I have a number of those Czech glass flower bell beads in my bead stash along with an assortment of glass leaf beads. Now I want to sort through them and see if I have enough variety for a pretty bouquet ring.